Advantages: This kind of deck is a classic and can be crazy fun to play. It is a powerful strategy that quickly outclasses other creature decks, and boasts a couple of late game combos that have the potential to win the game immediately. The deck has the potential to be pretty disruptive as well, with Harmonic Sliver and Necrotic Sliver. Disadvantages: Sweepers are pretty common in Commander, and they're tough for any creature deck to combat. Luckily, this deck has some built-in defenses (Pulmonic Sliver, for example) and several late-game sorceries that help bounce back (like Patriarch's Bidding). Also, the deck has very few ways to interact with combo decks. Changes: Of the new slivers in M14 that have been spoiled so far, there are a few that stand out above all the others. Bonescythe Sliver is a pretty easy upgrade to Fury Sliver. Galerider Sliver is a straight upgrade to Winged Sliver, but you may want two slivers that grant flying. 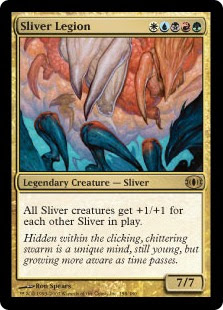 Syphon Sliver is strictly better than Essense Sliver, but it's another ability that you may want two of. Blur Sliver adds some haste redundancy, which is makes many of those "win out of nowhere" late game plays possible. Megantic Sliver makes your army huge. Manaweft Sliver helps the mana issues tremendously. This deck could use more than two "Slivers act like Birds of Paradise" enablers. 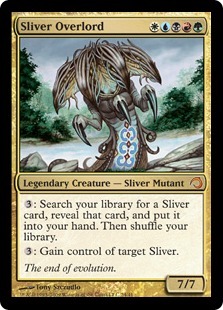 Predatory Sliver, like the old muscle and sinew varieties, is solid and efficient. The others don't seem so amazing, but there are still a few cards that have yet to be spoiled. 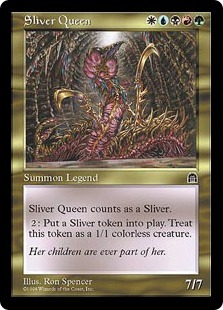 Perhaps M14 has a few more sweet surprises for sliver fans. Also, the land base I have here is a very low budget version. Wealthier players would probably want fetch lands and dual lands!